CAcert Inc. is an incorporated non-profit association registered with New South Wales (NSW), Australia. - It was incorporated by 24 July 2003, with the full association name CAcert Incorporated under the Incorporation No INC9880170. We have a DUNS number 75-605-6102. Every General Meeting, regardless if AGM or SGM, need to have at least five attending members. Voting: You need to have paid up your fees in order to be able to vote. A proxy vote can be done via appointing a proxy for your vote. See here: Association/Voting for more information. Annual General Meetings of the association are (should be) called yearly. Here is a draft and proposed agenda for the next AGM. Anyone can suggested items to be discussed, but only members have a say. See Special General Meetings for non-regular events. All current members of the Committee are Association Members. The Committee is responsible for the management of CAcert Inc. 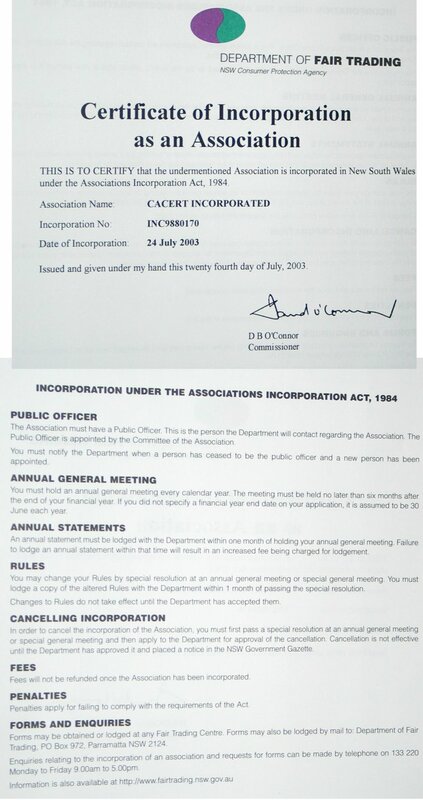 The Committee does not employ a secretariat so is responsible for both CAcert Inc. policy and its administration. Board business can be found at Committee (Board of Directors). Association Member means a member of the Association CAcert Inc., and is what is discussed on this page. Member means a person registered at the CAcert.org website as part of the community. (Community) Members are not discussed on this page. According to the policy decision p20080106.1 the term member now belongs to the community. This is because it significantly eases understanding in the community itself. What can an Association Member do? An Association Member is able to nominate or to be nominated to serve on the board (Committee) of CAcert Inc. An Association Member can vote at AGMs and SGMs on any motion that the board puts to the association membership or any resolution brought forward by an association member. If you want to become an Association Member of the CAcert Inc. Association, please read the association rules, and afterwards fill out this Application Form. A step by step guide for becoming an Association Member can be found here. First step then is to try to find an Association Member who will nominate you, and another to second the nomination. E.g. via a request to one of the CAcert email lists. When you find two association members tell them why you want to join and what you plan to contribute. Once nominated (the nominators will send a signed nomination form to the association members and CAcert board), the treasurer will notify you when you have to pay the annual membership fee in order to be a full member of the association with all rights and responsibilities as described in the official Association Rules. The easy way is to print off the Association Membership application form, complete it, scan it and send it of for nomination via a (CAcert cert) signed email.The other is to complete the digital forms, and sign it with a CAcert certificate. All Association Members must be on the membership email list. This list is for notices to Association Members *ONLY*, not for general discussions. This list allows the board to notify Association Members of any motions needing a majority vote to make changes, or for any AGMs or SGMs. If you are located outside of Australia you can pay your yearly membership fee by going to the membership fee page. The upper PayPal button on this page is a subscription button which will charge your PayPal account automatically every year, the lower button is for a single payment. If you pay from your Australian bank account please use a direct money transfer to: CAcert Inc, BSB: 032073, Account No. : 180264 and inform the Secretary of CAcert Inc. The current membership fee is 10€ per calendar year. The membership fee is due before the until the 30th June of each calendar year. Usually you will receive a reminder before the due date if you haven't paid yet. If you fail to pay your membership fees for two years you are not entitled to vote at the CAcert Inc. general meetings (Rule 33(5)), and three years of unpaid membership fees lead to cessation of membership (Rule 4(d)). So make sure that you pay your fees. Your membership can be resigned by sending a signed email to the Secretary of CAcert Inc.
CAcert has a wiki for information about CAcert services and certificates. It has a special place for CAcert Inc. and Membership information. It also provides info about the next General Meeting. Nominations for board function for elections will be notified on the wiki as well. This information is a wiki and so is not the formal CAcert Association membership information. No one is responsible for the contents of these wiki pages, but you may find information there which is meant as information exchange between Association Members. There is a member announcements and discussion email list: < cacert-members@lists.cacert.org > . If you are an association member you should have been added to this email list. Meeting notifications and notification of resolutions and nominations for board elections will be sent on to this list. If you are not receiving email via this list and you believe yourself to be a member, please contact the board or support as soon as possible. This list is can also be used for discussions between association members. A moderated list for sending (signed) emails to the CAcert Committee (board): < cacert-board@lists.cacert.org >. The Association conducts according to the Act and the Rules. The Act controls many things about the Rules, so typically, for a fuller understanding, we have to read them both together. you can only become an Association Member via nomination and acceptance from the board (called Committee). Association Members should not be involved with other Certificate Authorities. The liability is limited to the (unpaid) yearly fee (10 US$). CAcert must hold and Annual General Meeting, generally around December - February every year. The Committee (Board) has a maximum of 7 positions. 4 with a clear function: president, Treasurer, Secretary and Vice-President. 3 members with no extra role. 3 board members needs to be present at meeting in order to decide. There may be sub-committees installed by the board. We use the term Committee (from the Act) and Board (easier to understand) interchangeably. The Public Officer is the direct contact to the Director-General of Affairs (Australian Trade Office). The Public Officer must be resident in NSW. The PO must file a yearly report the Director-General of the OFT. The association is not permitted to provide own (money) gain for the association members (really non-profit for association members). The Committee needs to hold meetings. See Minutes for all records of meetings. Notices, decisions and resolutions can be done with email (signed, or CARS). 5% of members can form and petition the board for an Special General Meeting (SGM). at current numbers, that is about 3 or 4 members. Notes on the 1984 Associations Act. However these are superceded by the 2009 Associations Act now in effect. The Association is incorporated under a modified version of the model rules published by the NSW government under the 1984 Associations Incorporations Act. You can find the official copy of the CAcert Inc. association by-laws on the SVN repository. Current version is Jan-2010. These rules define the association operations, annual membership fee, liability of association members, elections, AGM, etc. In Appendix 1 you will find the membership application form. Appendix 2 has a form with which you are able to get a proxy for voting on your behalf at any formal meetings, such as the AGM, or any SGMs. The law applicable is the 2009 Associations Act (PDF and web). See Notes on the 1984 Act to see the historical context. The Act is implemented by the NSW Office of Fair Trading (OFT). For the current forms and legislation, look to the Office of Fair Trading: NSW Business Services which is the regulator of Associations, under the Act. There is a link in this document with the text "association rules". It is a link to an attachment named "CAcert_Rules2008.pdf". That attachment appears to be missing. At first I thought it was just unavailable when I realized I had not yet signed in to my Wiki account. But after signing in, I still get a form asking me to upload the missing attachment. I'm not sure who might fix this. I did not want to presume to disable the link since it appears to be broken. I hope this is the proper way for me to input feedback on this page. as the CAcert Inc rules do undergo a continuous upgrade, its a bad idea to attach one revision in the wiki. The next time the document will undergo an upgrade, this link will remain again in an inconsistency state and will not be updated (data inconsistency caused by unknown sources). So its better to set a link to the directory tree, where one may find the named dokument.